Five members of Europe's triumphant Ryder Cup team will feature in the World Match Play Championship at the London Golf Club starting on Wednesday. 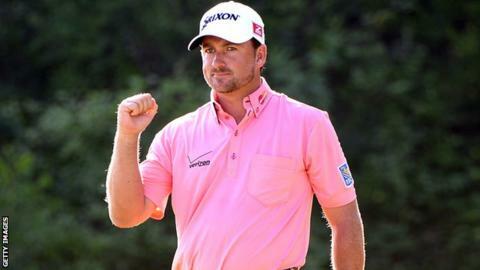 World number five Henrik Stenson is the top seed, and defending champion Graeme McDowell is seeded number two. Victor Dubuisson and Stephen Gallacher are in the same group, and Welshman Jamie Donaldson will also appear. The 16 players are divided into four round-robin groups with the top two from each reaching the quarter-finals. It is the 50th anniversary of the prestigious event, which was played at Wentworth until 2007. The tournament was not staged in 2008 or 2010 and after three editions in Spain was last year held in Bulgaria, when McDowell beat Thongchai Jaidee, in the final. The London Golf Club in Ash, near Brands Hatch in Kent, staged the European Open in 2008 and 2009 and the International Course is a 7,026-yard par-72 layout, with the 592-yard sixth the longest hole. Donaldson, who claimed the winning point for Europe at Gleneagles last month, is in a group with American Patrick Reed, who won three-and-a-half points out of four on his Ryder Cup debut. Henrik Stenson (Swe) world number five, top seed; Thongchai Jaidee (Thai) world number 41, seeded eight; Francesco Molinari (It) world number 48, seeded nine; George Coetzee (SA) world number 89, seeded 16. Jamie Donaldson (Wal) world number 25, seeded four; Patrick Reed (USA) world number 26, seeded five; Jonas Blixt (Swe) world number 58, seeded 12; Paul Casey (Eng) world number 66, seeded 13. Victor Dubuisson (Fr) world number 23, seeded three; Stephen Gallacher (Sco) world number 35, seeded six; Shane Lowry (Ire) world number 53, seeded 11; Pablo Larrazabal (Sp) world number 70, seeded 14. Graeme McDowell (NI) world number 18, seeded two; Joost Luiten (Ned) world number 37, seeded seven; Mikko Ilonen (Fin) world number 52, seeded 10; Alexander Levy (Fr) world number 74, seeded 15.